We totally get it ­­— just like writing about yourself, writing about your business can be tough. Between writing copy that will capture attention and trying to keep things short and simple, we understand how it can be intimidating. That’s why we put together this list of the five most important things to keep in mind when you write for your website. Not only does a text-heavy webpage look boring, but if a visitor isn’t able to skim your copy and learn what they want to know fast, they’ll lose interest. Prioritize the important stuff. Keep your copy brief and your sentences short. Don’t write just one draft — go back and edit your writing, eliminating any fluff and being as concise as possible. 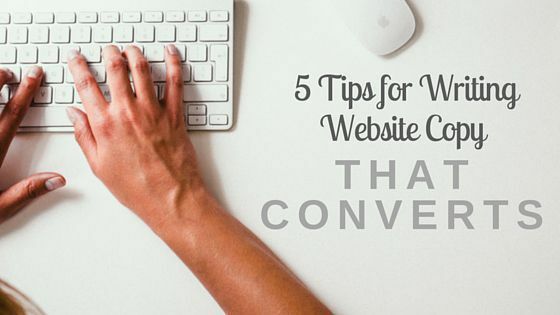 The language you use on your website should be easy to understand. Remember that you are an expert on what you do, but your customers probably aren’t. Avoid industry jargon, vague language, and clichés. Keep your vocabulary simple and straightforward to ensure you effectively communicate your message. Although your writing should be simple, it shouldn’t be boring! Bring some personality to your writing by infusing some of your company culture. Write like you would speak and address your reader directly as “you.” Don’t be too formal — write in a way that’s relatable and helps people get you. Including keywords in your copy makes it easier for search engines to find you online. Before writing your copy, come up with a list of 10 words that describe what you do and that people might use to search for your site. Incorporate those words in a way that sounds natural and not forced — out-of-place keywords will make your copy confusing and difficult to read. Want to show off your new copy? Let’s complement it with a new site — call us at 844.207.9038 or email hello@mopro.com and let’s get started!